Completing continuing medical education coursework has become increasingly challenging over the past several years, primarily due to escalating program and travel costs, and already massive time pressures on physicians. Yet the need to improve disease treatment through engaging educational activities and professional competency standards has not gone away. One of the goals of SciMed's new Virtual Diabetes Institute is to address this issue for physicians caring for patients with Type 2 diabetes. 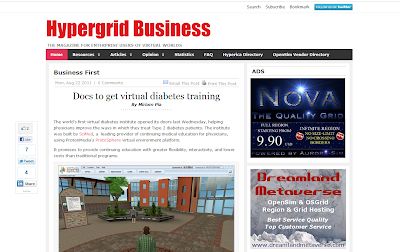 I recently talked to writer Miriam Pia about this, and she penned an article for Hypergrid Business covering how the Virtual Diabetes Institute supports more engaging and interactive training at lower cost for these physicians. She wrote about how the environment (created in ProtoSphere) lets physicians learn, network with peers, and complete their continuing medical education coursework on their own terms, without having to travel. For more details on these benefits of the Virtual Diabetes Institute, I'd encourage you to flip to her article. Thanks for covering this, Miriam.